Guardian Unlimited (GU) is running a Beta version of its latest, branded RSS newsreader tool, allowing readers to subscribe to and manage updated news feeds from their favourite news sites in one place. Newspoint was introduced on 28 November and is free to download. "The advantage is that we're providing the benefits of a newsreader in a non-technical way," said Lloyd Shepherd, deputy director of digital publishing at GU. 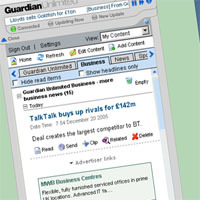 The publishers wanted to avoid using jargon that might deter readers from experimenting with the tool, so chose the term 'newsfeeds' rather than RSS or XML. NewsPoint should be particularly useful to news addicts and to MediaGuardian readers, said Mr Shepherd. MediaGuardian now has its own dedicated RSS feed. "This is an audience with a huge appetite for news, and traffic patterns show that users refresh the MediaGuardian home page throughout the day," he said. "That's RSS user behaviour, so NewsPoint is a much better tool for them." Publishers have been keen to develop RSS as an extra revenue stream for their sites, and NewsPoint already contains display advertising. One sponsor occupies the NewsPoint homepage and contextual text ads also appear further into the feeds. A Mac version is due to be launched in February when the newsreader will be promoted heavily in the newspaper and on Guardian Unlimited.